Burning Religion is the first, and at this point only, part of a proposed three-part series by the same name. Burning Religion looks at the spaces between impossibly competing positions, and seeks to discover the way across an impossible divide. It also imagines a theology birthed from the spaces between those impossible distances. Just as humanity has been envisioned as impossibly separated from God, with Christ as the miraculous answer to the impossible problem, Burning Religion imagines all of society’s impossible struggles within this same impossible/miraculous context. This first part proposes a path for such impossible navigation, and leads the way for part two, which will challenge the concepts of power in both religion and politics. Stay tuned to these pages, because Burning Religion will only get better from here. So, if you want to throttle your relatives when they talk about politics or religion, if you throw your shoes at the TV set when the news (or a commercial) comes on, if you would rather vote on a barstool than in a voting booth in the coming election, if every church service you attend feels like a funeral for a friend, or if you would like to get that capitalistic latest-greatest-ring-thing out of your nose, then this is a book for you. Burning Religion is a book. It is a dialogue. It is an attempt to navigate the space between religion, secularism, and many other polarizing issues in our world today. 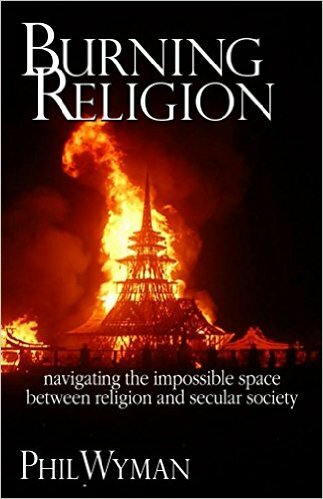 Burning Religion: navigating the impossible space between religion and secular society is a multi-genre book covering elements of philosophy, theology, psychology, sociology, anthropology, history, autobiography, poetry, and Carnivalesque tall tales in a thesis suggesting that making peace between disparate worldviews is not possible in any lasting way through typical moderate or third-way approaches. So called “radical” approaches are not radical enough. Finding lasting peace requires something insane. Burning Religion suggests that the insanity of the Carnival just might hold the key we are looking for. Burning Religion Parties, and speaking engagements can be arranged. Contact us for more information.